Apple Cap is one of the many names associated with this hat. Apple refers to its popularity in the Big Apple, New York City, where it is especially popular in the Full or Extra Full Cut. To determine the cut of your choice - whether it be Medium, Deep, Full or Extra Full - please see the Touring Cap Cuts page by clicking here. 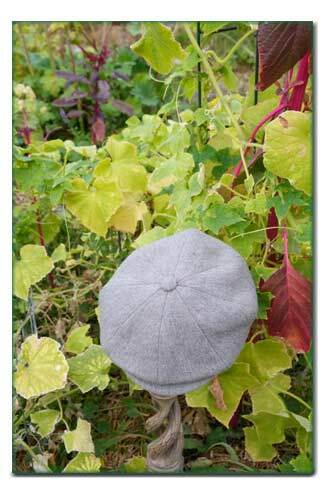 The Pendleton Wool featured in this hat is a medium weight tweed in grey with brown & sage highlights. It is easier to ask for help, when measuring your head with a cloth tape, however the task can be accomplished single handedly. Hat People Newsboys are designed to be adjusted smaller with an internal elastic band, so if there is a question about size, it is better to go with the larger choice. This size adjustment feature also works well should you need to tighten your hat in windy weather. This feature does not substitute our commitment to making Hats to the size you order, we just recognize that sometimes it gets windy. Further instructions on sizing can be found on our Ordering Information page. It is noteworthy that Pendleton Wool makes a great hat for rain and snow, in that it is naturally resistant to water. All Hat People People Hats are made in the mountains of Southern Oregon at the Hat Ranch; and if you have any questions please feel free to call us here during business hours, PST, phone (888) 930 4287 or email works well.